When I first began paintings of concrete block walls, I did a series called Urban Cave Paintings. 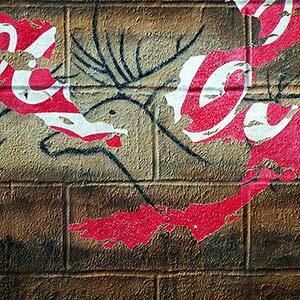 It features famous prehistoric art on contemporary cinder block walls. Years later, during my graffiti phase, I conceived of combining the two. 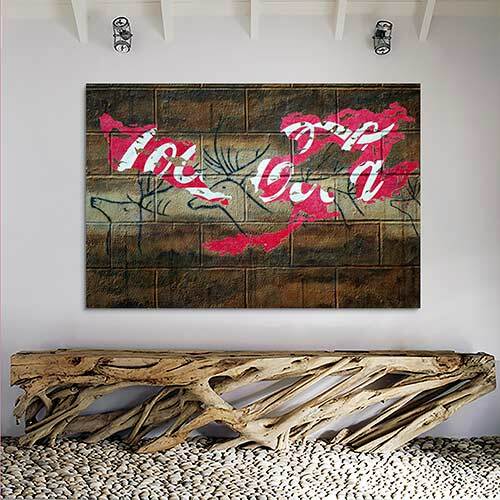 The painting "Classic" juxtaposes a contemporary icon with prehistoric cave painting, inviting comparisons of changing environments and corresponding rites of passage. For this piece, I painted the coca cola logo and cinder blocks first. I then taped over those parts of the logo that would be visible in the final design. It was important to provide enough of the logo to be recognizeable. Next I painted the famous "Swimming Deer" from Lascaux. Two classics. With careful observation, you will see that the cave painting is on top of the logo. A plot twist! In my humble, unbiased opinion, I think "Classic" would look great in ANY decor. Remember, I offer a 30-day money back guarantee and free international shipping. Thank you for spending time on my website. Enjoy your visit. 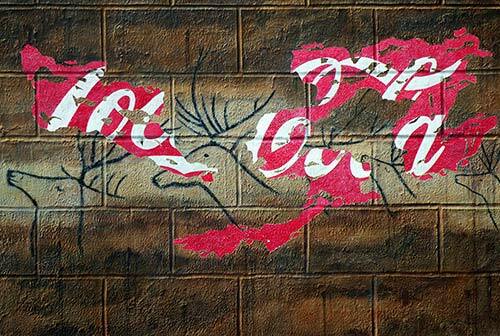 For this painting, I painted the coca cola logo and cinder blocks first. I then taped over those parts of the logo that would be visible in the final design. It was important to provide enough of the logo to be recognizeable. Next I painted the famous "Swimming Deer" from Lascaux. Two classics. With careful observation, you will see that the cave painting is on top of the logo. A plot twist!